Image: Two women and a man on the phone at the same time … http://www.thecine-files.com/wp-content/uploads/2015/12/pillowtalk.jpg .. This picture is from the 1959 movie “Pillow Talk” about two people who share a ‘party’ telephone line and despise each other. I am reminded of how my parents had a party line when I was little. My mom used to say to us, “Now, children, if you pick up the phone and hear someone talking [that would be the other family on our party line], then just put the phone down very gently. Be sure not to listen in! It’s not polite.” Once I picked up, heard a voice, listened to two words, and mom caught me in the act. Never again! This post is about modulating telepathic communication. Maybe a metaphor will help explain this: Let’s say you are a radio, situated in someone’s room. You are playing a radio station you like, and you figure they will like it too. But they are complaining! This music is too loud! I do not like country and western music! Switch to the pop music! And you do not know what to do. You do not know how to turn the radio down. So that is one situation. And here is another: You are the one sitting in your living room. There is a radio in there … Wonder how it got there? It starts playing C&W. You really prefer pop music, and right now you are in the mood for no music at all. You go to look, and find the radio disappears into thin air the moment you try to turn it off. The minute you turn around, there is that music again. Now, what to do about the radio? How to turn it down? How to turn it off? That is what I mean by Telepathic Modulation. Right now, I am in a situation where I am only linking to a few people, and not out of free will. Same thing from their point of view. Now one could look at this as the curse of the ages, or one could think of it as a learning experience … for instance, a chance to learn Telepathic Modulation. There is going to come a day … in the not-too-distant future … when we are all telepathic and clear in our auras and minds. When that day comes, it will be safe for us to be linked to the crystal grid of Earth, and to the core of Earth. That linkup will give us the ability to communicate telepathically with anyone on Earth. Intuition tells me that there are fail-safes in place … energy thresholds that must be surmounted before we can link with the crystal grid. These fail-safes stop us from getting too much power before we are prepared to use it wisely. So, no worries in that regard, thank goodness. As we became less aware, and grew in numbers, the Unconscious Thought Cloud of the World grew in power, and became more influential in our lives. Right now, largely due to urban crowding and the subconscious influence of mass media, the state of humanity is such that most of our actions are influenced by the collective unconscious, as is the case in the animal kingdom. Many call this ‘mind control’ … although this term is surely a misnomer, considering that we humans are not yet fully in control of our own minds, so the notion of controlling other minds is one step removed from the true cause. That true cause being the iron clad grip of the collective unconscious, internalized as the Shadow of the Personality … also termed ‘distortions in our morphogenetic field,’ or ‘ karmic accretions stored in our akashic records,’ about which I have written elsewhere. So, let’s say we are in the room with the unwanted radio. Seems to us like an attempt at ‘mind control.’ We would like to exercise a little mind control from our end of the situation, and get ‘whoever’ to take the dad-blamed radio away! But no matter how hard we try, with affirmations and imprecations, it does not happen. The radio keeps on reappearing in our living room. Last night, in the middle of the night, when the Unconscious Thought Cloud of the World was at its power peak … I awoke with a very strong, unwanted navel point corded connection to someone who was fed up with inability to modulate telepathy. Apparently at their wits’ end, not knowing what else to do, this person was attempting to influence the situation through mind control. Let there be no more Mind Control anywhere on Earth! May all beings be free! Powerful! Able to modulate their telepathic abilities through free will! I was feeling a state close to despair when I made this plea. This mind control thing had happened so many times before. I could tell how enmeshed I was with the mental and emotional bodies of those on the other end of my personal telepathic Party Line. Would I never be clear enough to exercise free will in this regard? And with those thoughts I fell back asleep. Benefits: This exercise helps re-establish individualization, a sense of ‘I Am I,’ or of personal empowerment. It helps integrate and strengthen the etheric body. It also helps turn off the ‘telepathic radio’. Background Information. Clairvoyants have seen, in the area of the lower abdomen of the subtle body known as the etheric body, an etheric organ known as the sexual chakra, from which physical vitality emanates. This organ is shaped like a double funnel (with a front and aback funnel) that has 6 petals or gears. Above that, at about the level of the navel point or umbilicus, is an etheric organ known as the solar plexus chakra, seat of will power. This organ is shaped like a double funnel (with a front and aback funnel) that has 10 petals or gears. Because of the navel point’s location in the abdomen, where the sexual chakra and the solar plexus chakra are, pumping the navel point in an out (also termed ‘churning’ the navel point) will stimulate both physical vitality and will power. Directions: Churn the abdomen at the level of the navel point slowly and gently in and out. Place your awareness on this gentle movement. Continue this practice as long as needed, whenever you wish to terminate telepathic communication. Image: Chakras, According to the School of Theosophy, side view … http://www.douglasbaker.org/zencart/images/5466.jpg .. Image: Chakras, According to the School of Theosophy, frontal view … http://www.geocities.ws/etherica/chakra1.jpg .. 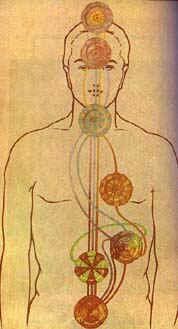 The above-referenced drawings of the chakras are very different from many chakric drawings. They show a basal chakra at the base of the spine. Above it, a five-petal disk at the navel point, indicating the seat of will power. Missing is the sexual chakra, possibly out of modesty. Then on the left side of the torso, the spleen chakra (which I term the ‘spleen organelle’), through which vitality globules (from sunshine) enter and invigorate the body. Image: Vitality Globule, According to Theosophy, and a Crop Circle Resembling a Vitality Globule … https://s-media-cache-ak0.pinimg.com/736x/9c/74/97/9c7497c94a5e48ee3462c51fcdc525ef.jpg .. Image: Chakras including points under the lowermost left and right ribs … http://www.esoterik.se/images/chakra4.jpg?crc=4114518419 .. Starting at the base of the spine, a disk representing the basal chakra. Above it the sexual or ‘sacral’ chakra. Above these two points, at about the level of the navel point, or a little higher, is the navel point, the chakra that is the seat of will. The larger of these is on the left side of the body, from the point of view of the embodied person. This is associated to the spleen chakra (which I prefer to call the spleen organelle), and to that part of the kundalini energy termed the Ida. The smaller is on the right side of the body, from the point of view of the embodied person. This is associated to that part of the kundalini energy termed the pingala. Then the heart chakra, the throat chakra, the third-eye point, and the crown chakra. Link: “In Depth Articles” … http://www.esoterik.se/artiklar.html .. It is to these two relatively unknown points … the Spleen Organelle, or Ida Point, and the Pingala Point, that I refer in the below meditation. Benefits. I gave the below meditation a try, with amazing results: My whole body became filled with vibrant energy. Directions. Sitting in a chair, with back straight and feet flat on the floor, concentrate your awareness on the Spleen Organelle (the Ida Point), located just under the lowest left rib, a little lower than the spleen. Imagine vitality globules being pulled toward this chakra, swirled around in it, and then streaming out into the various parts of the body. Or, if the right side of your body is weak, concentrate your awareness on the abdomen just under the lowest right rib (at the Pingala Point). Imagine as above, only at the new location. Continue until you feel completely full of energy. Directions. Sit down cross-legged on the floor, or sit, with spine vertical, in a straight-backed chair. Place your hands in your lap, palms up, and begin breathing deeply and slowly. This will increase circulation of the vital energy, and smoothe the emotional body. If the issue of telepathic modulation comes up again, repeat, as needed, this process of gently churning the stomach with a deep, slow breath. And that will be that! Link: “How to Be Polite on the Phone,” by WikiHow’s staff … http://www.wikihow.com/Be-Polite-on-the-Phone ..
… looked like a good start … it is a list of good phone manners that so frequently get left behind in the rush of modern life. As a case in point, sometimes we may get calls from telepaths that are angry or disparaging in tone, and we may not know how to deal with the incoming negativity … especially when the caller will not hang up. This may indicate a need to build one’s own self-esteem and self-respect. Video: “Julie Andrews-I Feel Pretty,” by Cindy Radcliphe, 14 June 2012 … https://www.youtube.com/watch?v=-0uiCkY67Rg ..
Video: “Self esteem song – Angel,” by tuschman168, published on 19 June 2010, http://www.youtube.com/watch?v=CswwaOG01MM ..
Well, dear ones, that is all for now. Link: “What Is a Chakra,” by Crystal Earth Spirit … https://crystalearthspirit.com/pages/what-is-a-chakra .. Image: Emotional Body … http://www.kheper.net/topics/subtlebody/emotionalB.jpg .. The subtle body known as the emotional body is portrayed by clairvoyants as multicolored, swirling lights. Along the centerline of the emotional body can be seen the variously colored chakras. Image: “The Etheric Body” … http://www.astramate.com/ethericbody.gif … This subtle body is depicted as lines of blue light within the outline of a human form. Along the centerline may be seen blue outlines of the chakras. This entry was posted in 02 – Etheric body / vital body / pranic body, 03 – Astral body / emotional body (4D), 2nd chakra - sexual chakra - sacral chakra, 3rd chakra - navel point, Astral cords, Chakras, Cities of Earth - Countries of Earth, Clair senses, Dominance-submission, Grid of Light – crystal grid – Christ consciousness grid, Grouping - leadership, Mastery of mind - subconscious - unconscious mind, Meditations - visualizations, Meditations and visualizations by Alice, Overcoming mind control through faith (see also 'implants'), Prayers - blessings - mantras - affirmations - white magic, Samskaras - karmic miasmic patterning - morphogenetic field distortions, School of Theosophy, Self-esteem - self worth - ostracism - abandonment, Shadow of our personality - dweller on the threshold, Spleen chakra - splenic chakra - spleen organelle - pranic reserve, Unconscious thought cloud of the world - noosphere, Yoga and tagged animal consciousness, Arthur E Powell, assertiveness, Astral cords, blessings, Chakras, churning the navel point, cities of Earth, clair chat, Clair senses, crystal grid, distortions of the morphogenetic field, Dominance-submission, emotional body, emotional body smoothing, etheric body, etheric body smoothing, grouping, groups, Ida Point, individualization, JScambio, Mass media, mastery of mind, Meditations and visualizations by Alice, mind control, morphogenetic field distortions, navel point, navel point churning, physical vitality, Pingala Point, polite communication, School of Theosophy, second chakra, self-esteem, self-respect, shadow of the personality, Spleen Chakra, Spleen Organelle, telepathic etiquette, telepathy, third chakra, unconscious thought cloud of the world, vitality, vitality globules, will power, yoga by Alice on 25 April 2013 by Alice B. Clagett.